UNITED NATIONS, May 22 -- Two members of Bosnia and Herzegovina 's Office of the Presidency came to the UN on Tuesday and, sitting next to each other, told quite different stories to the media. 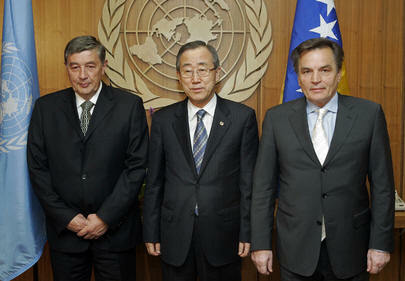 The chairman, Serb Nejosa Radmanovic, said that there is no need for the UN to continuing monitoring Bosnia. On the other hand, Haris Silajdzic, a member of the Office of the Presidency, said the UN is still needed, even while critiquing the UN's past performance and current silences on Bosnia. Inner City Press asked Mr. Silajdzic to name the UN's mistakes. "The UN Security Council dad an embargo on civilians in Bosnia and they died because of it," he said, then spoke of Srebrenica. And now that the UN's International Court of Justice has ruled that what took place at Srebrenica was genocide, "not a word from the UN, this is something I cannot understand," Mr. Silajdzic said. He also said that the media has been far too quiet. If nothing more happens, he said, "the International Court of Justice is a waste of time...an NGO as best," even "a joke." Video here, from Minute 36:35. Mr. Silajdzic is headed to Washington D.C., to discuss the dysfunctions in Bosnia. Mr. Radmanovic has "other engagements." Reporters asked Mr. Silajdzic what he anticipates discussing in Washington." It would bore you," he said, mentioning constitutional provisions and "what to name the police." Inner City Press asked about the timeline for merging BiH's two police forces, something urged by the European Union. "When, I do not know," said Mr. Silajdzic, referring to the "nucleus of constitutional problems or resolution." He was asked about Kosovo and dodged the question, saying that Bosnia has problems of its own. That must was made painfully clear, in Tuesday's press conference that smacked of a divorce proceeding, or perhaps, to be optimistic, an initial session of marital counseling. Regarding Srebrenica, a declassified July 14, 1995 cable from the U.S. embassy in Zagreb quoted a senior UN official that "as far as the UN was able to determine, there had been no significant mistreatment of the refugees by the Serbs," although he conceded that "with limitations imposed on the movement of the Dutch battalion by the Serbs, a lot could happen that might not be observed." In terms of this Dutch battalion's role, Adam Lebor's book "Complicity with Evil" notes that "Dutchbat's soldiers left behind the weapons, helmets and flak jackets, and medical supplies for the Serbs. Dutchbat arrived in Zagreb to a heroes' welcome from Defense Minister Joris Voorhoeve and Crown Prince Willem Alexander." A final, 2007 irony: earlier this month Crown Prince Willem Alexander was at the UN, chairing UNICEF's year of sanitation event. As the above-quoted diplomatic cable put it, "a lot could happen that might not be observed."